Bliss understands that the upper and lower areas of our eyes have different concerns for each area and that just one cream does not fix all! 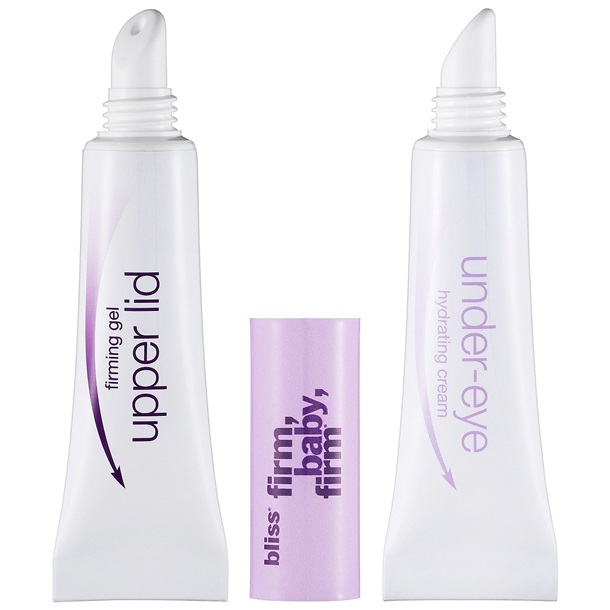 Bliss Firm, Baby, Firm Total Eye System - 7.39ml x 2 - $68 - A dual-sided, dual-action total eye system that firms and smooths the eye area while reducing the appearance of fine lines and wrinkles for beautiful, more youthful-looking skin. With gardenia stem cells, X-50 cell-targeting peptides, and phyto-retinoids that helps to support natural collagen and elasticity for an instant and long-term lifting effect, visually plumping hollow areas from the inside out, and reducing the appearance of fine lines and wrinkles - packed into a concentrated aloe base featuring soothing lavender and patented irritation-reducing and permeation-enhancing technologies. 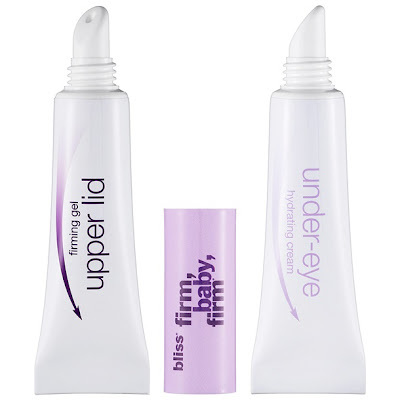 For the upper lid is a firming gel with instalift goji that lifts and firms stubborn brow bone sagging immediately while providing a long-term tightening, smoothing and lifting effect to the eye lid. The under-eye benefits from a hydrating cream with actiflow technology that increases microcirculation to diminish the look of dark circles and puffy under-eye bags.